2020 Dems embrace climate, but will voters? It's just a few weeks into the presidential primary season, and already Democratic contenders are talking far more about climate change than they have in the past. But do Democratic voters care? Historically, climate has not been a top priority listed by voters — including Democrats. But the first two years of the Trump administration have seen a significant shift, according to those who track voter trends, propelled in part by rollbacks of climate regulations. The shift also comes as voters are experiencing climate change or seeing that it is happening around the country, said Karyn Strickler, the founder and president of Vote Climate U.S. PAC. A series of deadly extreme storms and wildfires that were influenced by climate change has newly engaged some Democratic voters on the issue. Some experts say voters are increasingly driving the politicians and that a robust plan to address climate change will be a necessity for the eventual winner in the crowded field of Democratic candidates. "Voters lead politicians, not the other way around," Strickler said. "Climate change may not have been the top issue at the ballot box, but voters have been urging action in polls, in marches, in constituent lobby meetings, and Democratic candidates are finally picking up the mantle and taking voter positions." Strickler's organization launched a voter's guide last year that gave candidates across the midterm elections a "climate calculation" rating their positions and voting record on the issue. The group plans to launch a similar guide for the presidential primaries. Certainly, the 2018 midterms showed mixed results for climate votes. On the one hand, there were major defeats: Voters rejected both a new carbon fee on greenhouse gases in Washington state and a Colorado initiative that would have banned fracking near buildings and protected lands. On the other, voters in Arizona and Nevada approved ballot measures that are poised to dramatically increase the share of renewables powering the grid. Democrats, many of whom had a strong climate policy message, took control of the House after a night of historic wins. Ahead of the midterms, liberal Democrats ranked climate policy and environmental protection as a top issue, according to a poll conducted by Yale University and George Mason University. Notably, liberal voters placed climate policy above education, the income gap, the economy and even Russian interference in the election, said Anthony Leiserowitz, director of the Yale Program on Climate Change Communication. "Global warming is no longer a mid- to bottom-tier issue among the Democratic base. It's No. 4, and environmental protection is No. 3," he said. "That's up there with health care and gun policies. "That's stunning," he added. "That was not the case five years ago." Climate change also rose with more moderate and conservative Democrats, who ranked environmental protection eighth and global warming 16th, as well as with moderate Republicans, who ranked them 11th and 23rd, respectively. That was an increase for all groups, and a sign that the electorate is already changing on climate change, Leiserowitz said. There are other signs that more voters could be swayed by climate change in the primary and presidential elections, compared to past elections. 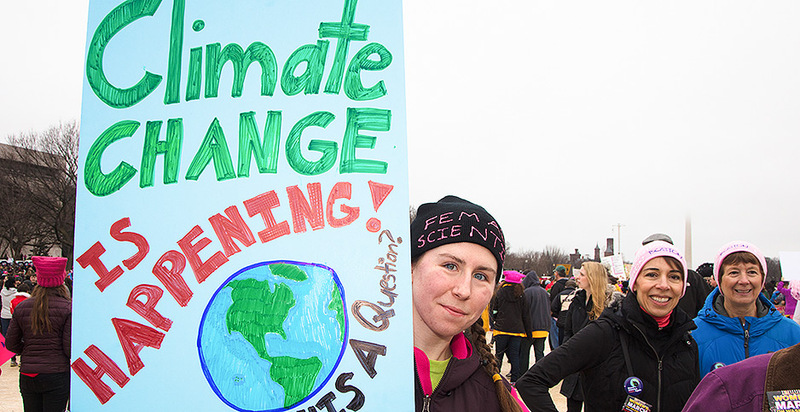 Climate change is an issue that doesn't divide younger voters the way it does older generations, according to a new Pew Research Center analysis released last week. Pew found that Generation Z — those aged 13 to 21 in 2018 — are more likely to accept that humans are warming the planet. What's more, Generation Z Republicans, as well as millennials, want the government to do something about it, Pew found. "The youngest Republicans stand apart in their views on the role of government and the causes of climate change," Pew found. "Gen Z Republicans are much more likely than Republicans in older generations to say government should do more to solve problems. And they are less likely than their older counterparts to attribute the earth's warming temperatures to natural patterns, as opposed to human activity." Before November 2020, more extreme storms and wildfires will likely affect Americans, record temperatures will likely continue to hit cities and carbon dioxide emissions will likely continue to rise, experts say. The more the Trump administration ignores or downplays climate change, the more some Democratic voters will be engaged, Leiserowitz predicted. "Politically, Trump has been one of the best things to happen to the climate movement," he said. "Trump doesn't understand that the more he says the things he does, the more he draws attention to it, and the more he rallies the opposition around, he helps bring focus to it." Indeed, two new polls released this week show that about 3 in 4 voters are worried about climate change and that Democrats and Republicans alike are more concerned than ever that global warming could affect their families. In particular, voters have been influenced by images of extreme weather in the media, as well as their own experiences. The likelihood that climate change will remain in the news will ensure that Democrats keep using it as a wedge issue that could peel away some small part of the undecided electorate, said Norm Ornstein, a political scientist and resident scholar at the conservative American Enterprise Institute. But it remains an open question as to how strongly even Democratic candidates will embrace climate policy. Several contenders have expressed support for climate policies, but only Washington Gov. Jay Inslee has made it his central message (Climatewire, Jan. 23). And voter embrace of climate policy will differ sharply in red and blue states, as well as in key swing states that Trump and his challenger will need in order to claim the presidency, Ornstein said. That may mean that even if climate policy becomes a part of the Democratic primaries, it will get lost during the general election, he said. In general, candidates who run one way in the primary election often pivot sharply when it's time for the general election, Ornstein noted. He added that the stream of news about Trump will likely overtake the issue in the final months before November 2020, particularly if the economy weakens or Democrats impeach the president. "I think it becomes an issue that you promote during a fall campaign because of the contrast between the parties and the hope and expectation that you can put the other side on the defensive, at least some of them," he said. "But in terms of whether corruption in government, the catastrophe of Trump is a more dominant theme. We're heading at some point, probably before the election, for a recession." Nonetheless, groups pushing voters to care about climate plan to increase their activity headed into election season. The Sunrise Movement has been instrumental in pushing for a "Green New Deal" to decarbonize the economy and boost renewable energy. Eight in 10 voters support the idea, including two-thirds of Republican, according to recent Yale polling. The earliest crop of Democratic presidential candidates is already endorsing the idea, which has the potential to be stronger than any of their previous climate policy proposals. A number have also pledged to reject donations from fossil fuel companies. Activists plan to push candidates further on climate pledges at campaign events and will time their activities to create voter awareness during hurricane and wildfire season, when the effects of climate change are most visible, said Stephen O'Hanlon, a spokesman for the Sunrise Movement (Climatewire, Jan. 15). "The 'Green New Deal' is not just a climate policy, it's a policy to transform our economy, to tackle poverty, lift up the people who have been left behind by the economic recovery over the past 10 years with programs like a jobs guarantee," O'Hanlon said. "We see that as really critical to building broad support and melding climate change with jobs, which is a perpetual concern for Americans." He added: "If candidates want to be taken seriously by young people, want young people to turn out in the ways they turned out in 2018, they need to back the 'Green New Deal' and reject fossil fuel money."